Make your own Christmas cards this Christmas to show your loved ones just how much they mean to you. Christmas truly is the perfect time of year for expressing your love for those around you and there is no better way than to create something special and personal for those you care about. Creating your own Christmas cards really is quite easy. You need a few simple supplies like cardstock, some Christmasy patterned papers, a few embellishments (such as Christmas stickers, rub-ons, ribbons, brads or buttons), some glue and a little spark of inspiration. Shopping for your supplies is a lot of fun (there’s so many cute things out there to choose from! ), but many of us find ourselves struggling for ideas and feeling frustrated when we finally sit down to make our cards. You can find yourself just sitting there staring at all your goodies and wondering what to do with them. Does that happen to you too? Card making sketches are the perfect solution. They take all the hard work out of making your own Christmas cards by showing you exactly how to design your cards with whatever supplies you want to use. The sketch gave me my basic design elements (a rectangular base, a strip down the left side and a big circle). I chose the supplies I wanted to use and just got stuck into making my card. It was so easy and so much fun that I even had the confidence to add an extra design element of my own (the sentiment). What do you think? Card making sketches puts the fun back into making Christmas cards (no more stressing out about how to make it look just right) and saves you so much time (an absolute blessing if you have as many Christmas cards to make as I do). 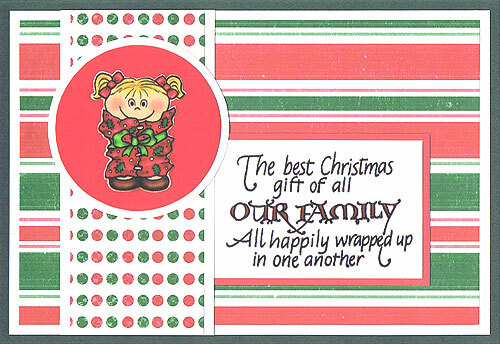 Make your own Christmas cards this year and wow your loved ones with your creative talents. There is nothing better than making that special someone smile at this special time of year.